Macho B (The only Wild Jaguar in the U.S.) was killed by researchers in Arizona a year ago. The Arizona Game and Fish Department just (3/2010) fired the technician that trapped him, when they found he and another researcher had cleaned up the female juguar poop they used to bait him into the snare with. 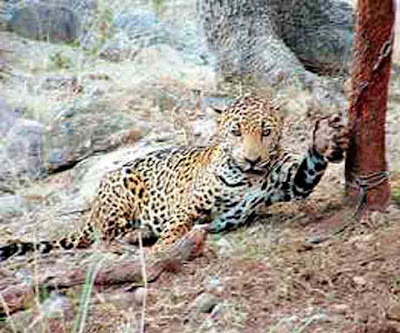 They were trying to hide the evidence that they had illegally trapped the jaguar. They claimed to be attempting to snare a cougar or black bear and that the Jaguar was caught accidentally. Strange that they had a specially made GPS radio collar for jaguars with them when the caught Macho B.
Macho B died of kidney failure 10 days after being snared by his front paw, darted and and radio-collared. His snared paw is swollen twice normal size. The taxidermist hired to skin him, found a large draining abcess at the dart wound site. There is a federal investigation looking into this crime. I took this photo off of the internet, so the quality is not great. Researchers in Our National Parks (Yellowstone, Grand Teton, Glacier, Denali) use this same type of snare to capture Grizzly Bears to put radio collars on them. I suspect that they injure every animal they capture this way. How appalling and so very sad that man just does not learn to respect wildlife. It amazes me that they such a method to catch them!